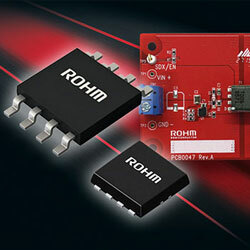 ROHM has developed isolated flyback DC-DC converters that remove the need for types of feedback circuits such as methods using a limited-life photocoupler or auxiliary winding with a large transformer. This simplifies power supply configuration greatly, making them perfect for industrial equipment that requires advanced safety functions, such as power storage systems, FA equipment, and high power inverters. The series includes two models offered in two different package types. BD7F100 is an optocoupler-less isolated Flyback DC-DC converter with primary side control. It uses the company’s State Of Art Adapted-Type ON-Time Control Technology to control the output voltage. No additional parts to keep the loop stable are required. The BD7F200 covers all applications with a power requirement from 1W to 10W, at an input voltage range from 8V to 40V. Both are available with two packaging options, HSON8 and HTSOP-J9. Also, for the BD7F100xxx-LB and BD7F200xxx-LB, an evaluation board integrating the BD7F100HFN-LB is available. The BD7F100HFN-EVK-001 evaluation board makes it simple to evaluate and verify the operation of their isolated flyback DC-DC converter controller (24V input, 5V/800mA output).